for highways and roads, houses, airports and factories. Infrastructure — buildings and transportation, communication and utility networks — is vulnerable to damage from a variety of geologic hazards, such as volcanoes and earthquakes. But karst geohazards are stealthy. They come silently from below, then unexpectedly make themselves known. And because they usually affect a segment of a utility line, or one home, or one short length of highway, their cost is also stealthy. But the toll adds up. Karst landscapes and aquifers form when water dissolves limestone, gypsum and other rocks. The surface expression of karst includes sinkholes, sinking streams and springs. Kentucky is one of the world’s most famous karst areas. About 38 percent of the state has sinkholes that are recognizable on topographic maps, and 25 percent has obvious and well-developed karst features. Much of the state’s beautiful scenery, particularly the horse farms of the Inner Bluegrass, is a direct result of the development of a karst landscape. Many of Kentucky’s cities are built on karst. Springs and wells in karst areas supply water to tens of thousands of homes. Much of Kentucky’s prime farmland is underlain by karst, as is a substantial amount of the Daniel Boone National Forest with its important recreational and timber resources. Caves are also important karst features, providing recreation and unique ecosystems. Mammoth Cave is the longest surveyed cave in the world, with more than 350 miles of passages. Two other caves in the state stretch more than 30 miles, and nine Kentucky caves are among the 50 longest caves in the United States. The economic losses of karst hazards are largely hidden because they are scattered across an area the size of a state, and individually they affect small areas when compared to tornado damage, for example. Most people don’t realize how much they are affected because the costs appear in the form of higher taxes and an increased cost of living. The cost of repairing roads, preparing special foundations for large buildings (schools, for example) and extending public water lines to replace polluted groundwater all add to the costs of public projects. Researchers at the Kentucky Geological Survey foresee an increasing need for research on karst geologic hazards because of the accelerating pace of suburban development. Delineating karst groundwater basins is vital to protecting the quality of water discharged from springs and wells, and is an important tool for understanding the hydrology of sinkhole flooding, one of the most common karst hazards. Karst hazards include sinkhole flooding, sudden cover collapse, leakage around dams, collapse of lagoons resulting in waste spills and radon infiltration into homes. Most noticeable are sinkhole flooding and cover collapse. Damage to infrastructure from these two causes is so common in Kentucky that it is typically dealt with by local authorities as a routine matter. Seldom are collapses reported to any central agency. Sinkhole flooding is one of the more tragic hazards because it affects private residences the most. Take the house pictured on page 16. Built in the 1970s, this house has been repeatedly damaged by flooding of a karst valley (large sinkhole) since 1989. The karst valley in which it was built is large and was, therefore, at ground level, not recognized as a closed depression, while the outlet from the karst valley cannot accommodate peak runoff from upstream. The only way a potential, and very astute, buyer of this house could be warned of the flooding danger would be by consulting a topographic map. Sinkhole flooding usually occurs during the same storms that flood rivers, so it is sometimes not recognized as karst related. Unlike a normal stream channel, the karst conduit has a fixed area that cannot increase in cross-section in response to floods. Because of the loss of energy to friction and the finite cross-sectional area of the karst conduits, large increases in water pressure are needed to increase, even by a small amount, the flow in cave passages. Sinkholes can also flood when their outlets are clogged, preventing water from being carried away as fast as it flows in. Trash thrown into a sinkhole can clog its throat, as can soil eroded from fields and construction sites or a natural rock fall near the sinkhole’s opening. Sometimes the conduit itself is too narrow because it has recently (in the geologic sense) captured a larger drainage basin. The reach of a conduit downstream from constriction could carry a higher flow than it is receiving were it not for this restriction. Sinkholes flood more easily around development — roofs, parking lots, highways — which increases both the total runoff and the rapidity of runoff from a storm. A second reason that sinkholes flood is because of backflooding, the outcome when the discharge capacity of the entire karst conduit network is exceeded. Some upgradient sinkholes that drain normally during the short, modest accumulation of storms, may actually become springs that discharge water during prolonged rainfall. 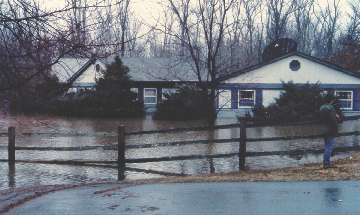 The Kentucky Department of Emergency Services estimates that a March 1997 flood cost more than $1 million in mitigation costs alone — including buyouts and construction of stormwater detention basins — for a few counties in the central and western Kentucky karst areas. Sinkhole flooding in Bowling Green is well known and has prompted Warren County to enact strict zoning regulations and building codes. The state geological survey has been part of efforts to address karst-related flooding problems in Jessamine County and the cities of Versailles, Lawrenceburg and Princeton since 1990. Versailles has spent approximately $500,000 to purchase flood-damaged property in order to take remedial action. The survey’s experience at these sites suggests that the average annual loss statewide exceeds $1 million from flood damage alone. Cover collapse occurs when the soil collapses into an underlying grike, a fissure made larger as water dissolves limestone. Cover collapse is similar to subsidence, except that it happens suddenly in a small, focused location. At right: A cover collapse sinkhole opened under this city sidewalk in Lexington, Ky., on Feb. 19. The sinkhole is being repaired with a graded filter constructed from broken concrete from the sidewalk and layers of crushed stone. Leslie K. Russo. Kentucky Geological Survey. Both heavy rains or extended droughts can bring on cover collapse. Each weakens the soil over a grike, either by saturating the soil with water or robbing it of cohesion. Near buildings, downspouts and leaking utility pipes can accelerate the process. Eroded soil falls into the grike and water moves the soil to an underlying cave, forming a cavity in the mantling soil. In high- flow events, water in the cave may backflood into the overlying soil. As the water recedes, the cave and grike drain faster than the soil, which means that saturated soil spans the void in the grike. The overloaded soil arch falls into the soil cavity and the cover collapses. The erosion of soil into the underlying conduit does not automatically stop when an impermeable surface, such as a highway, parking lot or building, is constructed over the sinkhole. Lateral flow can easily continue to erode the soil. The typical scenario is when no local ordinance prevents a developer of a rural subdivision from filling sinkholes. The developer builds a house on a filled sinkhole from which the fill continues to be undermined. Subsidence results, sometimes decades after the developer is gone. Homeowners’ insurance in Kentucky does not pay for subsidence damage, except for that attributable to underground coal mining in counties where specified by law. Unlike in Florida, where the cover over the limestone is very thick, cover-collapse sinkholes in Kentucky are unlikely to swallow entire buildings. Cover-collapse sinkholes do, however, severely damage buildings, drain farm ponds, damage roads and utility lines and wreck farming equipment. 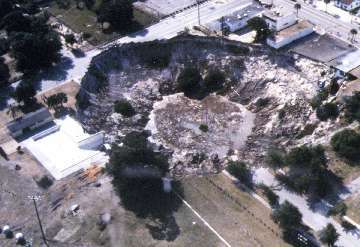 Even as we wrote this article, co-author Jim Currens visited three cover collapse sinkholes, one of them pictured above. In Kentucky, infrastructure damage from karst has included Wolf Run Dam on Cumberland Lake in southeastern Kentucky. The dam was constructed in the 1940s on Lower Mississippian calcareous siltstones interbedded with reef carbonates, Devonian black shale and Upper Ordovician dolomites. Although karst conduits and caves were encountered and remediated, the extent of karst development at the site was not fully recognized during construction. In the late 1960s, sinkholes developed near the downstream toe of the dam. Reservoir water was passing beneath the cutoff trench. The problem was solved with a diaphragm cutoff wall nearly 4,500 feet long and up to 278 feet deep. The repairs cost millions of dollars and could have been avoided if its original builders had obtained better on-site geological data. At left: This house was built in a large karst valley that has flooded repeatedly since 1989. The karst valley is not recognizable as a closed basin without a topographic map or knowledge of the surrounding area. James C. Currens, Kentucky Geological Survey. Many other reservoirs of all sizes have leaking dams or leakage through carbonate bedrock around the dam. Leakage through caves passing under the dam of Shanty Hollow Lake in Warren County and leakage through bedrock forming the abutment bank of Spa Lake in Logan County are more recent examples of karst damage. Highways are also vulnerable. 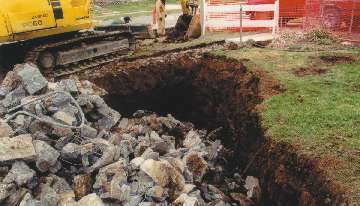 In the mid-1990s, a cover-collapse sinkhole appeared overnight in the northbound lane of Interstate 65 near Elizabethtown. Fortunately, no one drove into it, but it did require extensive repairs. Many other collapses have occurred along state and county roads. Exceptional costs for highway construction projects and repairs to existing roadways since 1995 are estimated to exceed a half million dollars a year. Storm- and sanitary-sewer lines commonly leak, which can trigger cover collapse and break the utility pipe. The only certain way to avoid economic and environmental damage from human activity on karst terrain is to avoid building on karst. But the demands of economic growth are applying irresistible pressure to develop the karst lands of Kentucky. Unfortunately, only a few cities and counties have zoning regulations governing construction in karst terrane. Topographic maps at a scale of 1:24,000 are available for the entire state, but citizens and planners sometimes do not recognize the significance of a closed topographic contour, and businesses and homes continue to be built in sinkholes. The Kentucky Geological Survey is working on two fronts to reduce the economic losses from karst terrane. The highest priority is to develop maps that give specific warning of karst geologic hazards: for example, maps indicating sinkholes that have a history of flooding. The karst groundwater basin maps can be used to specifically protect the watersheds of springs used as water supplies. The survey has produced six karst groundwater basin maps and plans to produce more. Groundwater dye tracing is continuing across the state. We hope to produce quadrangle maps depicting sinkholes that have historical documentation of flooding, and a second set of maps showing the probability that the cover of a sinkhole will collapse. The second approach is public education. The survey is publishing brochures and posters to distribute to schools and the public. But the most effective educational tool is to give invited presentations to planning and zoning boards, city councils and conservation groups dealing with a karst issue. These groups don’t need to be convinced of the reality of karst-related geologic hazards, and the knowledge we supply is eagerly received. Geologists classify sinkholes based on their geometry and how they developed. Understanding sinkhole dynamics is critical to detecting and mitigating damages these karst features can cause. Collapse sinkholes occur when the bridging material over a subsurface cavern cannot support the overlying material. The cover collapses into the cavern and a large, funnel-shaped depression forms. Solution sinkholes result from increased groundwater flow into higher porosity zones within the rock, typically through fractures or joints within the rock. An increase of slightly acidic surface water into the subsurface continues the slow dissolution of the rock matrix, resulting in slow subsidence as surface materials fill the voids. Alluvial sinkholes are older sinkholes that have been partially filled with marine, wetland or soil sediments. These features are common in Florida, where the water table is shallow, and typically appear as shallow lakes, cypress “domes” and wetlands. Raveling sinkholes form when a thick overburden of sediment over a deep cavern calves into the void and pipes upward toward the surface. As the overlying material or “plug” erodes into the cavern, the void migrates upward until the cover can no longer be supported and then subsidence begins.